QuiltCon 2018, here we come! Hello! Are you taking one of my classes? Maybe you just want to see what we're going to be up to. If so, you've come to the right place! I am teaching five classes at QuiltCon. Locate your class below and find some tips on how to prepare for class. The supply lists show a number of items, both required and optional. I will be bringing along samples of my favorite thread, Wonderfil DecoBob for everyone to share and try out. If you have questions that other might want also want the answers to, ask in the comments below and we will try to answer you ASAP. I can't wait to see you all in sunny Pasadena! UPDATE! All QuiltCon pre-orders have been packed up for our trip to Pasadena! But don't fret, I will have extras of all the supplies for sale in class. Cash and credit cards will both be happily accepted - see you next week! The pattern and hexagon templates are required. You can purchase these ahead of time or in class. 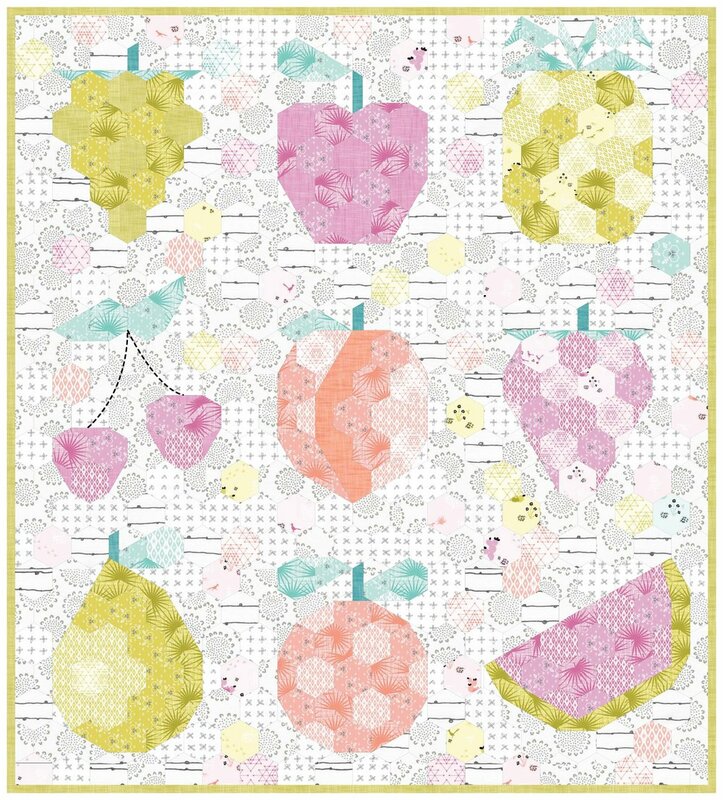 You will need enough fabric to get started on one fruit block of your choice. There are kits available in my online shop for the entire quilt or you can bring your own with you. This is a great quilt to use up those scraps! You only need to bring enough for one block. I will have all of the supplies available for purchase in class except fabric. The fabric in the online store is all we have and once those kits sell out, we are out. In either class, you can use The Barn Owl, The Lion or The Peacock patterns. The pattern is required. You can purchase ahead of time or in class. 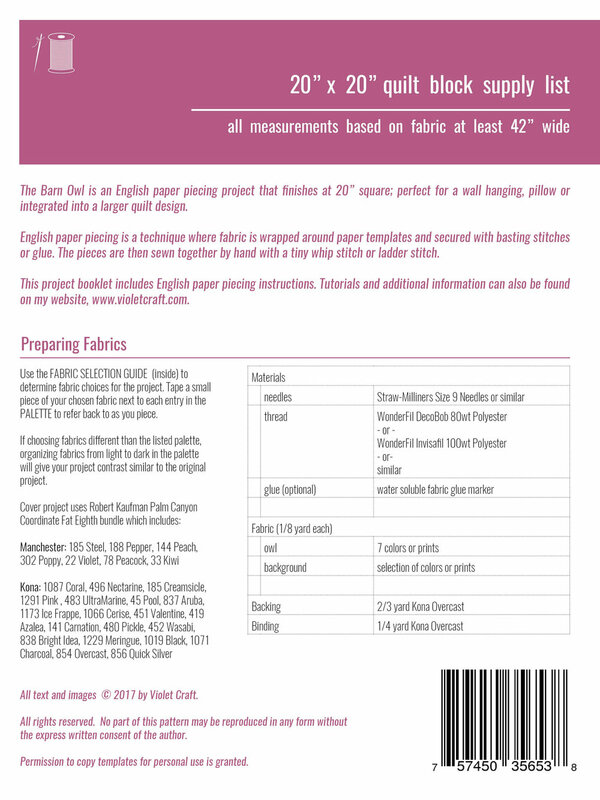 Fabric requirements are listed on the back of each pattern shown below. There are kits available in my online shop for The Barn Owl EPP. This is the only one we have kits available for at this time. I will have all of the supplies available for purchase in class except fabric. The fabric in the online store is all we have and once those kits sell out, we are out. FDP200 - Shake Your Foundation Tail Feathers! The pattern is required. You can purchase the PDF ahead of time or the paper pattern PLUS templates ahead of time or in class. If you purchase the PDF from me or the pattern from somewhere else, you will need to copy your templates ahead of time or purchase a copied set of templates in class. Fabric requirements are listed on the back of the pattern shown below. There are no fabric kits available for this pattern at this time. I will have all of the other supplies available for purchase in class except fabric. I am often asked if I precut. For most of my Abstractions patterns, I do not precut anything. For this particular pattern, you can precut the pieces for your feathers as noted in the pattern depending on which view you are making. You will not need to have everything precut for class.